Unique contact cleaner, rejuvenator, conductivity enhancer and lubricant. 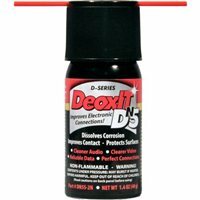 Dissolves oxidation and corrosion on metal surfaces. Fills in microscopic gaps and reseals surface for better contact to enhance flow of electricity. Chemically improves metal-to-metal connections and contacts. Improves connector performance/reliability. Temperature range: -34 to +200OC.